Qualcomm has revealed its plans to enter the server CPU market with a custom processor based on a design from U.K. chip company ARM. Qualcomm becomes the latest vendor to build a server chip using the ARM architecture, which is widely used in smartphones and tablets. Some believe ARM can challenge x86 in the data center because of its low-power characteristics. It's aiming the chip at hyper-scale customers such as Facebook and Google, as well as service providers and large enterprises. It says the chip will be suitable for cloud workloads including big-data mining, machine learning, and Infrastructure as a Service and Platform as a Service offerings. Qualcomm demonstrated a pre-production chip in San Francisco on Thursday. It's a purpose-built system-on-chip, different from its Snapdragon processor, that integrates PCIe, storage and other features. 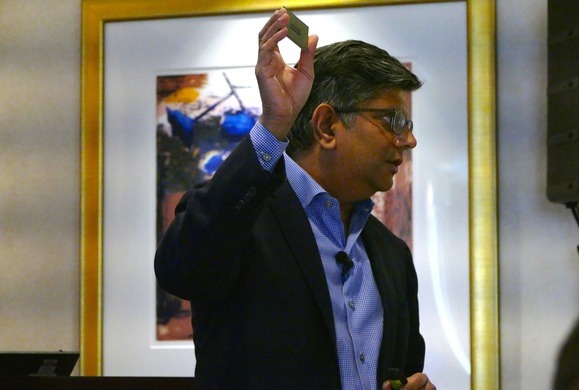 The initial version has 24 cores, though the final part will have more, said Anand Chandrasekher, Qualcomm senior vice president. The company is shipping the part to big customers now for testing, he said, though he declined to name them. He also wouldn't say when a product will be available commercially; Qualcomm will provide an update on that during the next year, Chandrasekher said. Still, it's been working on the part for two years and demonstrated it Thursday running a version of Linux, with the KVM hypervisor, streaming HD video to a PC. 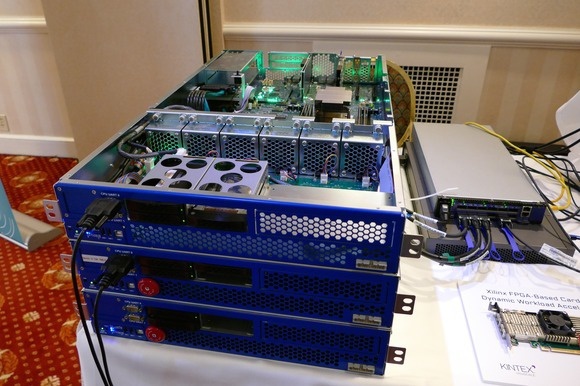 The chip was running the LAMP stack -- Linux, the Apache Web server, MySQL, and PHP -- and OpenStack cloud software. Chandrasekher was joined by the CEOs of Mellanox and Xilinx, who are working with it to build a complete server platform. Mellanox is designing network cards to work with the SOC, while Xilinx said it will build programmable chips to speed up particular workloads. “We believe this will enable the market, which today is fully controlled by one player, to have diversification and improved performance,” said Xilinx CEO Moshe Gavrielov, referring to Intel. Qualcomm joins a long list of companies targeting the same space. AMD, Cavium, AppliedMicro, Marvell, and Broadcom already have ARM server processors on the market. But Qualcomm is a powerful entrant thanks largely to its huge smartphone business, and it appears willing to invest heavily. "We realize this is a long-term investment that will take multiple years," said Qualcomm President Derek Aberle. It's early days for ARM chips in servers, and it doesn't seem like Qualcomm is in danger of being left behind. A few big companies have been kicking the tires with ARM servers, including PayPal and Baidu, but the market is still broadly in the testing phase, said Patrick Moorhead, lead analyst at Moor Insights & Strategy. One of the biggest challenges is that the software stack needs to mature, he said. Nathan Brookwood, principal analyst at Insight64, differentiates between two classes of hyperscale customers. Giants like Facebook and Google design their own servers and write their own software. For those companies, moving to a new architecture is more feasible if they see sufficient benefits, he said. But service providers like Amazon and Microsoft, with AWS and Azure, are running workloads for customers who developed their software for x86 servers. Those will be harder to move over. In addition, Intel has responded to ARM with low-power versions of its Xeon chip, and with other server processors based on its Atom core, which was originally designed for mobile devices. "You can’t look at Intel’s product roadmap and say they’re missing something," Moorhead said. Still, ARM's model of licensing its architecture to multiple vendors makes it easier for a challenger to x86 to emerge, Brookwood said. "ARM is really the only alternative for companies that want to do something unique. You have everyone competing within this common ecosystem, and that's a game-changer," he said. Big service providers are often reluctant to talk about what they do in their data centers, but some companies have been kicking the tires with ARM servers. AppliedMicro said this year that PayPal has deployed its ARM chips in servers, and Marvell has said Baidu is using its ARM products. French hosting company Online, a subsidiary of telecom giant Iliad, has also reportedly build a bare-metal cloud based on thousands of ARM servers. Driving these companies is a desire to cut energy costs and make better use of power in their data centers. "The limiting factor is how much power you can get in the building," Gavrielov of Xilinx said. "If you can come up with a low-power solution, that will be very attractive to them."